INDUSTRY.co.id - Jakarta - For Indonesian music lovers, be happy! The biggest music festival in Indonesia, Soundrenaline 2017 will be ready to shake Garuda Wisnu Kencana, Bali on 9 and 10 September 2017. Novrial Rustam, Managing Director of KILAU Indonesia as the organizer, said that Soundrenaline became the biggest music festival in Southeast Asia, for this time #UnitedWeLoud theme, which aims to voice the unity in music, exexcise, and creativity in music. 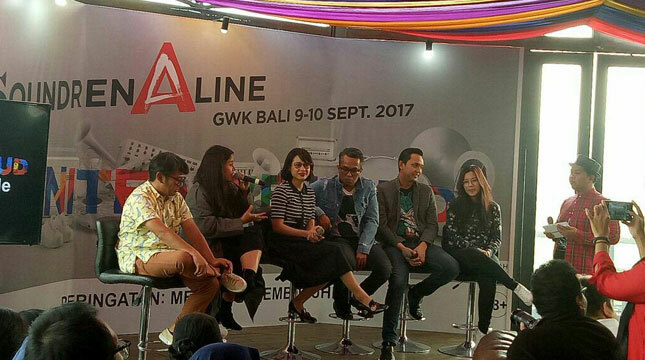 "Soundrenaline has been held for three consecutive years in Bali and this year is deliberately held in Bali Since 2002, Soundrenaline wants to present a consistent music festival consistent in terms of presenting exciting musical entertainment in the country, and consistent in the month of its implementation In September, "Novrial Rustam said during a news conference ahead of Soundrenaline 2017 in Kebayoran Baru, South Jakarta, on Tuesday (11/7/2017). Why consistently held in September, he added, so that music lovers from home and abroad can enjoy it. Soundrenaline 2017 has also announced performers for the first phase. A row of musicians who will be present include the band from Australia, Jet and a number of pride group homeland, such as Sheila on 7, Burgerkill, Payung Teduh, Kotak, Tulus, Andien, Stars and Rabbit, Kelompok Penerbang Roket, HMGNC, Bottlesmoker, Elephant Kind , Lolot, Mondo Gascaro, Danila, Rendy Pandugo, and others. There will also be a number of special collaborative projects such as Rhythm of the People, Soundrenaline Project, Glenn Fredly with the Rocket Fly Group, Andien with Scaller, and so on. Adib Hidayat as a music observer, said that many new names emerging in the music Industries, from all genres that have a place in the world of homeland music, enjoy the best music is to see music presentation from musicians directly, therefore the music lovers should not Skip Soundrenalin this time. In addition to music, this festival will be enlivened by various activations. Starting from mural, fashion, and others. Soundrenaline tickets 2017 has gone on sale online. Ticket price per day sold for Rp 200 thousand rupiah, and Rp 250 thousand rupiah for two-day pass. "We are not targeting the number of visitors, but we just want to show the music for the music lovers of the homeland and they feel happy and satisfied," he concluded, Novrial Rustam, Managing Director KILAU Indonesia.